Whether you are planning a girlfriends’ spa getaway or a fun family outing, Hilton San Diego Resort & Spa on Mission Bay is your ideal destination for a dream vacation – or perhaps we should say “baycation.” This beautiful bayside resort offers everything you need to restore your body and spirit, from luxurious treatments at Spa Brezza to tennis, paddle boarding and sailing to playing in the pool. The resort is surrounded by swaying palms and a perfect sandy beach, and boasts waterfront dining options, a state-of-the-art fitness center and spacious guest rooms. 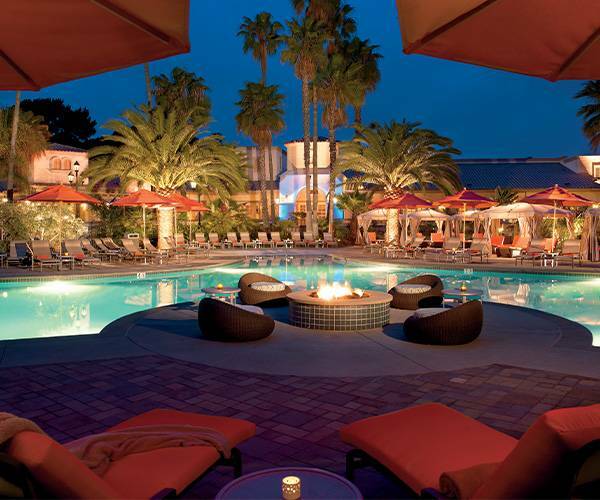 Children will enjoy Hilton’s Kids Kamp, bike rentals and dive-in movies by the pool, and couples will relish relaxing massages and intimate dinners at Acqua California Bistro. Soak up the sun, jump in the pool or unwind at the spa: whatever inspires you, you’ll find it at Hilton San Diego Resort & Spa. Imagine you are relaxing in a luxurious spa located in San Diego's most beautiful resort getaway, overlooking the waterfront of San Diego’s Mission Bay. You’ve just imagined Spa Brezza where you will discover treatments designed to calm your body, inspire your soul and revive your senses. Spa Brezza is known for expert services from massages to beautifying facials, and body wraps ands featured curated treatments for men, couples and bridal parties. Even children can enjoy experiences like “My First Massage” and “Mini-Manicures,” when accompanied by an adult. In addition, Spa Brezza's salon offers manicures and pedicures, along with hair and makeup designs performed by our talented artists. The spacious fitness center features state-of-the-art Life Fitness, and steam rooms to saunas, and private men and women's locker facilities. Hilton San Diego Resort & Spa on sparkling Mission Bay is the ideal setting for romantic getaways, fun family vacations and special occasions. Relax in luxury in your private poolside cabana. Treat yourself to S’more’s Night or pick up fun games from sand toys to jumbo checker’s boards. Reserve a bike or beach cruiser or spend a day on the water. (Think jet skiing, paddleboarding, water skiing or sailing.) Sign up for tennis or take a walk around beautiful bay. Explore SeaWorld® San Diegoand the San Diego Zoo or spend a night on the town in the vibrant city of San Diego. This exciting resort also accommodates events from small meetings to large conferences and is the quintessential location for gorgeous weddings. This is San Diego and the resort’s bright and airy rooms are all about the sun and sea. Every room and suite reflects the comfort of this waterfront oasis and features luxury bedding and linens, designer furniture and private balconies or patios. Deluxe rooms and villas and expansive studios all feature garden, bay or waterfront views And if you’re looking extra room for your family vacation or planning to entertain, spacious suites offer the space, views and amenities you expect on your dream vacation. 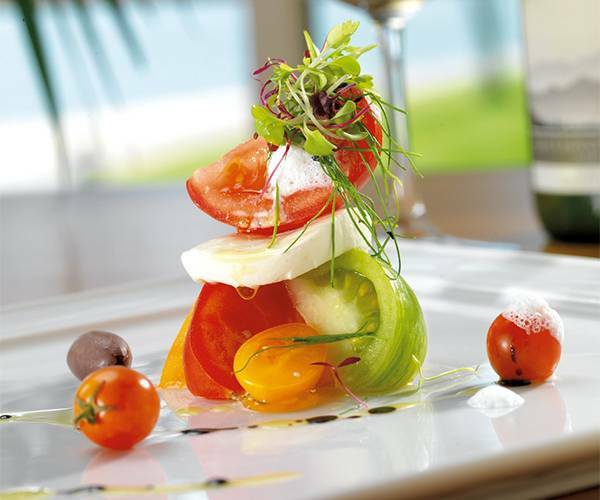 Hilton San Diego Resort & Spa has delicious – and healthy– dining options for every taste. The signature waterfront restaurant, Acqua California Bistro, offers New American cuisine with a European twist – served with a view of Mission Bay. Acqua’s adjoining The Olive Lounge hosts an extensive bar and cocktail menu as well as outdoor fire pit seating. Aroma, Hilton’s very own coffee house serves Zoka coffee, fresh pastries and grab and go sandwiches. Or if you are planning a day of fun in the sun, Fresco’s tasty snacks and cocktails are created to satisfy your appetite while you relax poolside. And when you’d like to relax and enjoy the privacy of your room or suite, room service is available from 6:30-11 p.m. daily. Guests can also order Hilton specialty gifts and amenities delivered directly to their rooms, from sweet and salty treats to a welcome wine served with decadent truffles.